A cheaper alternative inspired by Tama's flagship Iron Cobra design is always going to be a winner. Solid, powerful and fast. Comes with a rigid case. Dubbed 'Iron Cobra Junior', Tama's HP200B pedal is a solid, powerful piece of gear. Boasting the same Power Glide offset cam found on the road-proven Iron Cobras, the pedal has a wickedly fast action that really propels the beater into the head. 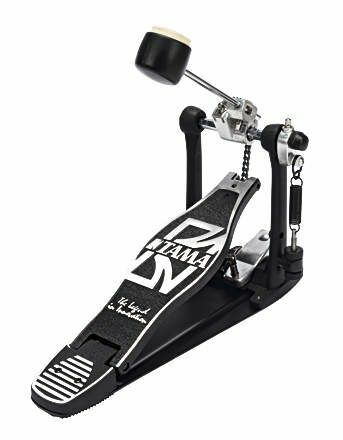 A host of other features borrowed from or inspired by Tama's ﬂagship hardware line complements the pedal, from the Para-Clamp hoop clamp to the spring tension adjustment. It is also supplied with its own rigid case.